This collection is FREE to buyers of UltraSeps software and is included on the UltraSeps DVD. Its also available as a stand-alone product for non-users and can be purchased for only $49. 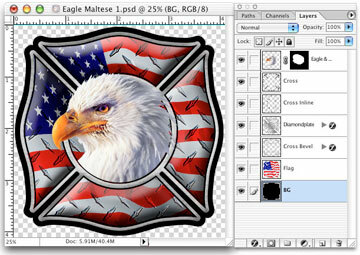 Its a collection 80 high-quality layered Photoshop files that can easily be modified. Each file also includes a vector cut path for those wishing to make decals. To view the entire collection of art, see the "Free Stuff" link on the above right corner of this site and select "Fire Disk". Within 24 hours of purchase, you'll receive a download link via email. No disk is shipped and file download size is 305mb. Images require Adobe Photoshop to be installed on your computer.